Mark O’Rowe’s plays include From Both Hips (Fishamble, 1997), Howie the Rookie (Bush Theatre, 1999), Made in China (Abbey Theatre, 2001) and Crestfall (Gate Theatre, 2003). Howie the Rookie won the George Devine Award when it premiered at the Bush Theatre in 1999. It also won the Irish Times Best New Play Award and the Rooney Prize for Irish Literature. 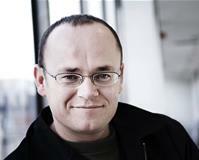 In 2007 he wrote Terminus, a series of interlocking monologues, which opened at the Abbey Theatre and won a Fringe First when it transferred to the Edinburgh Festival in 2008. It undertook a major world tour in 2011, touring for five months to the US, UK and Australia. In 2003, Mark wrote his first feature film, Intermission, which starred Colin Farrell and Cillian Murphy. His other screenplays include adaptations of Jonathan Trigell’s novel, Boy A, for Cuba Pictures and Channel 4; Perrier’s Bounty; and Daniel Clay’s 2008 novel Broken, which starred Cillian Murphy and Tim Roth. He wrote the short films, Epithet (2011), and Debris (2012), which he also directed.